Before discussing "Lesson One - Learning the Basics" I want to mention a few keys parts from "Preliminaries - Setting the Stage." Review Setting the Stage on pages 21-24. In Supportive Climate, review pages 32-39. Go over the communication rules with your students. Decide how you will verbally handle student error. The author doesn't want you to use the word, mistake and a few other words (listed on page 34). 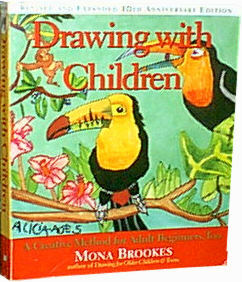 On page 70, there is a suggestion of how to handle the situation in which the child does not follow directions. On page 66, the author suggests that a child who has trouble drawing the angled line does not have the fine motor skills to do so and she suggests how to handle that. The author suggests hand-outs or copies of some of the pages. See page xxvii to see which copies you should make. In lesson one, the student learns about the Elements of Contour Shape. The files below are somewhat of a printable version of the lessons article, not this page, "Lessons for Lesson One". Choose a doc type, txt, or pdf. The same files are offered on the Lessons Article. Drawing Ia linked above has printable files that could be used for the matching warm-up and on Drawing Ia, the mirror warm-up. The Grids web page has a blank 4x4 grid that might be useful for making the warm-ups. Page 58-59: This part has suggestions that create a positive setting for the lessons. They contain preventative measures, little things that matter. Pages 59-65: Have your copy of page 60 handy and go over the elements of contour shape with your students. If you have enough white boards, your students could practice drawing the elements of shape after you go over each one. If not, use paper. How you teach this is up to you. On pages 64-65 the author describes a visual game to play. The visual game can help your child notice the elements of shape in real items. Lessons: At the lessons page this is lessons B and I. There are five warm-ups in Lesson One and they are: 1. random warm-ups; 2. duplication warm-ups; 3. matching warm-ups; 4. mirror image warm-ups; and 5. abstract design warm-ups. The warm-ups can help your child become accustomed to drawing the elements of shape. The warm-ups are helpful in other ways. The duplication warm-up can help children learn to copy what he sees and copying accurately is important. The matching warm-up can help children accurately notice shapes and details - and noticing details is important. The abstract design warm-up is helpful in that children will practice listening and following instructions. Lessons: At the lessons page this is lessons C , D , E , F , G , and H.
The last part of lesson one in which your child draws recognizable objects using the elements of contour shape that he has been practicing. Lessons: At the lessons page this is lessons J and K.
This ends the brief overview of Drawing with Children - Lesson 1: Learning the Basics. This article was written from the perspective of one who is preparing to teach classes to their children based on the book Drawing with Children. This is not a book review.